Freedom Over Me: Eleven Slaves, Their Lives and Dreams Brought to Life by Ashley Bryan is a Newbery Honor Book, Coretta Scott King Author Honor Book, and Coretta Scott King Illustrator Honor Book, and the author notes that he was inspired to write about the 11 slaves listed as property for the Fairchilds estate in 1828. The slave-related document only listed the slaves as “woman” and “boy”, etc., and no ages were given. Bryan ascribed ages and names to these slaves and gave them jobs on the estate, and the stories he tells in a free-verse poetry format are telling. My daughter and I read this together in February for Black History Month, but it is a book that has lessons that should be taught to kids everyday. Bryan’s illustrations aim to breathe life into the dreams of these slaves, those who are bound to an estate with little hope of freedom, except in their minds. They have skills praised by their owners, and any money they earn from the neighboring plantations enriches their owners. It’s hard to see how this life could not make the slaves feel hopeless, but Bryan’s free verse poems recall the inner freedom their skills and accomplishments can bring — they have dreams of something more, if not for themselves, for others who they teach and mentor along the way. From musicians to architects and doctors, these slaves had dreams that out shined their current situations. 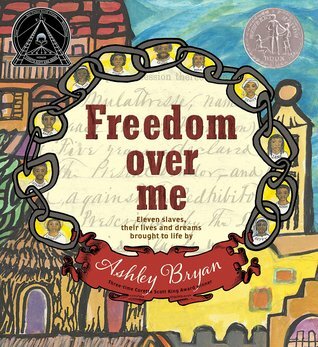 Freedom Over Me: Eleven Slaves, Their Lives and Dreams Brought to Life by Ashley Bryan demonstrates the harsh realities of slavery, while still providing children with a glimmer of hope and joy. It speaks to the resiliency of the human spirit, as well as the darker drive to control others and deem them less worthy for arbitrary reasons. The illustrations are bright and dreamlike, and kids will be drawn in. My only complaint is that the free-verse is very narrative, and less rhythmic than expected. Ashley Bryan grew up to the sound of his mother singing from morning to night, and he has shared the joy of song with children ever since. A beloved illustrator, he has been the recipient of the Coretta Scott King—Virginia Hamilton Lifetime Achievement Award and the Laura Ingalls Wilder Award; he has also been a May Hill Arbuthnot lecturer, a Coretta Scott King Award winner, and the recipient of countless other awards and recognitions. His books include Sail Away; Beautiful Blackbird; Beat the Story-Drum, Pum Pum; Let It Shine; Ashley Bryan’s Book of Puppets; and What a Wonderful World. He lives in Islesford, one of the Cranberry Isles off the coast of Maine. The Usborne Outdoor Book, which we purchased for my daughter’s birthday. The Usborne Fairy Palaces Magic Painting Book, also purchased for my daughter’s birthday. Explore the enchanting world of Fairy Palaces with this incredible magic painting book. Sweep carefully over the wonderful black and white patterns and drawings with the paintbrush provided, and watch the colours magically appear. With clear instruction on the front, this book couldn’t be easier for children and adults to use. Each delicate illustration is so intricate that every page conceals a palette of colours waiting to be discovered. A therapeutic and satisfying activity book children will enjoy painting and showing to their friends. Completed paintings can be kept as a keepsake. Ada Twist, Scientist by Andrea Beaty, illustrated by David Roberts, also purchased for our daughter but from her Scholastic February order form. Freedom Over Me: Eleven Slaves, Their Lives and Dreams Brought to Life by Ashley Bryan, also purchased from the February Scholastic sheet for our daughter. Imagine being looked up and down and being valued as less than chair. Less than an ox. Less than a dress. Maybe about the same as…a lantern. You, an object. An object to sell. In his gentle yet deeply powerful way, Ashley Bryan goes to the heart of how a slave is given a monetary value by the slave owner, tempering this with the one thing that CAN’T be bought or sold—dreams. Inspired by the actual will of a plantation owner that lists the worth of each and every one of his “workers”, Bryan has created collages around that document, and others like it. Through fierce paintings and expansive poetry he imagines and interprets each person’s life on the plantation, as well as the life their owner knew nothing about—their dreams and pride in knowing that they were worth far more than an Overseer or Madam ever would guess. Visually epic, and never before done, this stunning picture book is unlike anything you’ve seen. Wildly into the Dark: Typewriter Poems and the Rattlings of a Curious Mind by Tyler Knott Gregson for review. Tyler’s third collection includes more of his popular Typewriter Series poems (featured in his first book, Chasers of the Light) as well as never-before-published scenes that paint the world as only Tyler sees and experiences it. Filled with vivid photographs and even more vivid emotions, Wildly Into the Dark is a must-have for longtime fans as well as newcomers to Tyler’s unique brand of passionate, intimate, and playful words and images. The Jane Austen Project by Kathleen A. Flynn for review. London, 1815: Two travelers—Rachel Katzman and Liam Finucane—arrive in a field in rural England, disheveled and weighed down with hidden money. Turned away at a nearby inn, they are forced to travel by coach all night to London. They are not what they seem, but rather colleagues who have come back in time from a technologically advanced future, posing as wealthy West Indies planters—a doctor and his spinster sister. While Rachel and Liam aren’t the first team from the future to “go back,” their mission is by far the most audacious: meet, befriend, and steal from Jane Austen herself. Carefully selected and rigorously trained by The Royal Institute for Special Topics in Physics, disaster-relief doctor Rachel and actor-turned-scholar Liam have little in common besides the extraordinary circumstances they find themselves in. Circumstances that call for Rachel to stifle her independent nature and let Liam take the lead as they infiltrate Austen’s circle via her favorite brother, Henry. But diagnosing Jane’s fatal illness and obtaining an unpublished novel hinted at in her letters pose enough of a challenge without the continuous convolutions of living a lie. While her friendship with Jane deepens and her relationship with Liam grows complicated, Rachel fights to reconcile the woman she is with the proper lady nineteenth-century society expects her to be. As their portal to the future prepares to close, Rachel and Liam struggle with their directive to leave history intact and exactly as they found it…however heartbreaking that may prove.